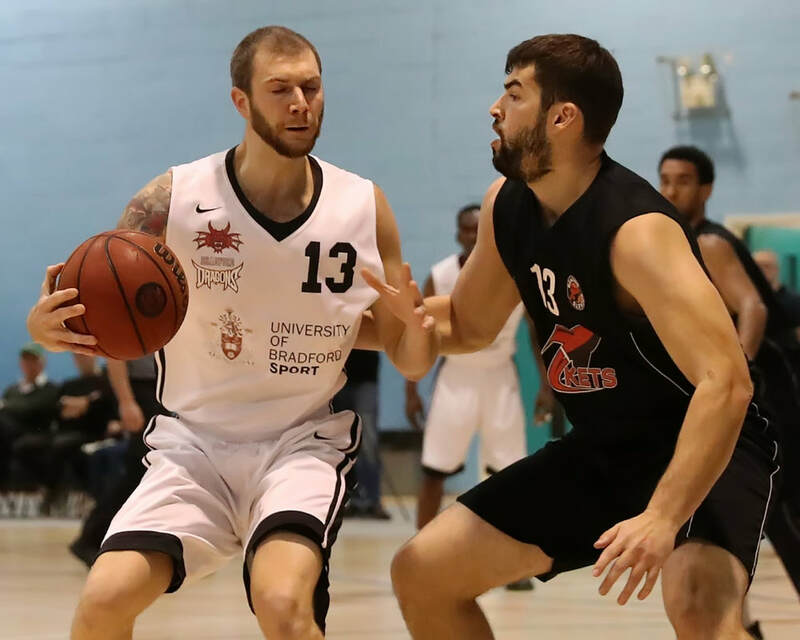 Bradford Dragons suffered their third straight defeat in a row (91-79), when they visited Essex Leopards on Sunday afternoon, for their National Basketball League division one fixture. 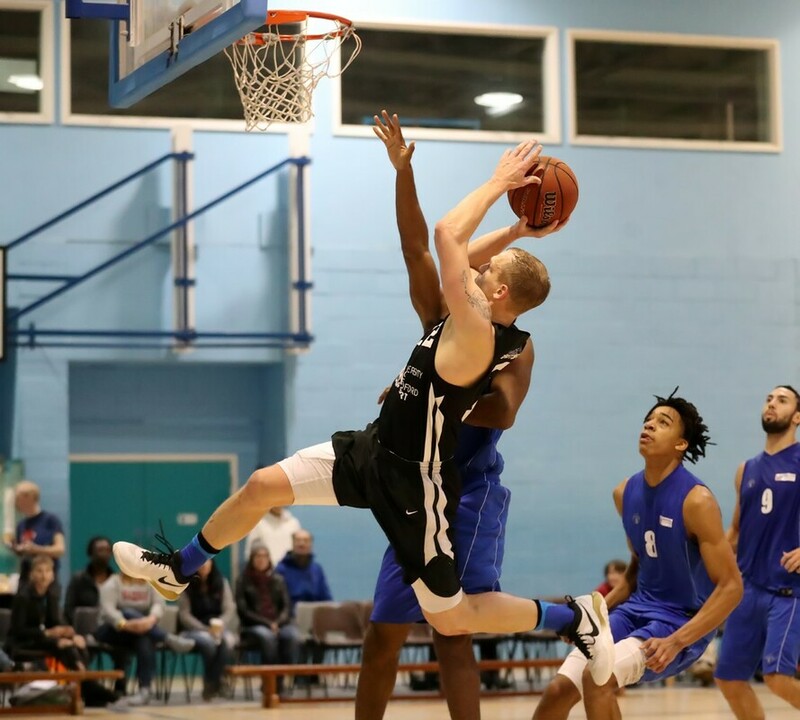 It was the first time that the two sides had met since Essex’s surprise elevation back to the top flight, following Team Northumbria’s withdrawal from the league during the summer. And whilst it took some time for the Leopards to find their feet, recent results suggest that they are certainly ready to compete at this level. ​Bradford travelled without Rafi Saipe (injury) and Jermaine Laing (unavailable) but were joined on the bench by youngster Great Osobar, who has been making himself noticed in the Dragons under 18s this season. ​​It took over two minutes of play to see the first score on the board, a three-pointer from Essex’s Sam Newman, and then a further minute before the Dragons finally registered points, with a two-point turnaround jump shot by Allie Fullah. Rihard’s Šulcs then put the Dragons ahead and Andreas Lycoudis added a single from the line, following a Technical foul awarded against the Essex bench. Essex responded with another three-pointer to regain the lead, but the two sides traded baskets throughout the remainder of the first and it was Bradford who entered the first break with the slimmest of advantages, at 13-14. Three minutes into the second quarter and Bradford’s lead was up to four points, thanks to scores from both Šulcs and Clayfell Harris. However, the hosts wouldn’t let go of the leash and quickly pulled themselves back into the lead. With only a minute of the half remaining the Leopards’ advantage was up to seven points, although a couple of free throws from Fullah and a single from Matthew Armstrong reduced it to just four before the buzzer (36-32). Within a minute of the restart, the Dragons had once again regained the lead and when Lycoudis sank a three, three minutes in, they were in control of a six-point margin (38-44). But, once again the Leopards would not lie-down and a succession of threes saw them quickly overturn the deficit and regain the advantage. With two minutes of the penultimate period remaining, the Leopards were nine points clear, although a two-point layup from Harris reduced it back to seven before the end of the quarter (63-56). Ricky Fetske reduced it further, with a quick layup, at the start of the final quarter, but they were unable to pull themselves back into contention as the hosts led throughout the final ten minutes. 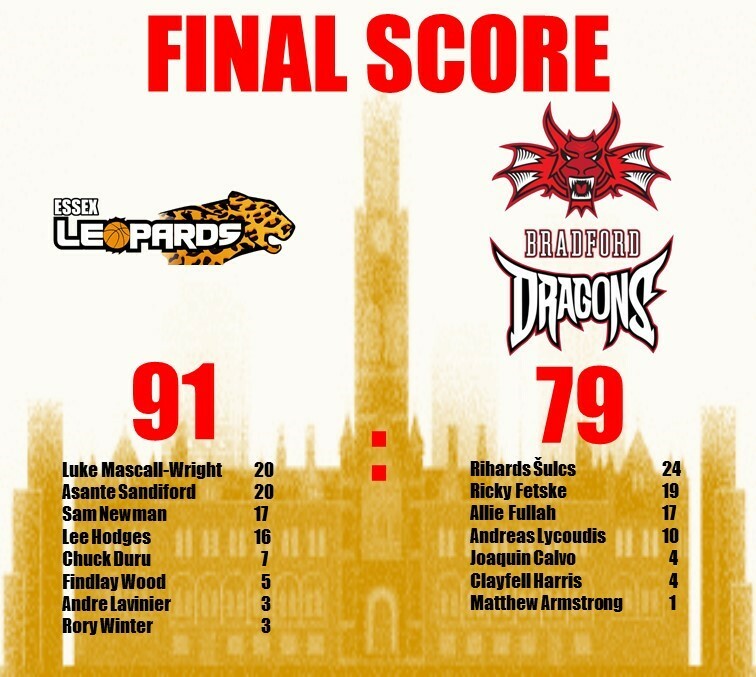 Final score, Essex Leopards 91, Bradford Dragons 79. Despite the loss, Bradford’s Šulcs registered the games high score, with 24 points, whilst also adding 10 rebounds for a double-double. Fetske also registered a double-double with 19 points and an incredible 20 rebounds. Fullah chipped in with 17 points and Lycoudis also hit double figures with 10 points. The result saw Essex leapfrog the Dragons into eighth in the table, leaving the Dragons just outside of the coveted play off spots. ​The Dragons have a weekend off from League action this coming weekend, however they entertain Worthing Thunder on Sunday afternoon (4:15pm) in the semi-final of the National Trophy. This will be Worthing’s third visit to the Dragons’ Den this season and Bradford are yet to record a victory against them. However, they will be hoping for a good sized crowd on Sunday afternoon to help cheer them through to their first Trophy final. Advanced tickets are available via the club website.